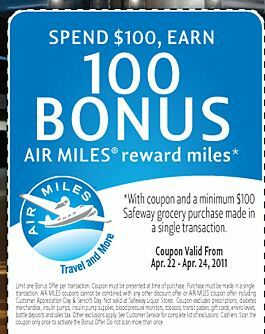 With Safeway I love the fact that you can earn Air Miles points on your purchases. You can use these points towards gifts, gift cards ect. Make sure that you apply for a Safeway club card as well. * High Liner pan seared fillets - buy 1 get 10 air miles. Use the $1.00 coupon from the April Smart source insert. * Catelli Smart pasta - 2 for $5.00. Use the $.75 coupon from http://www.save.ca/. * Finish powerball tabs - $5.00. Use the $1.00 coupon from the April 16th Smart source insert . * Finish Quantum - $5.00. Use the $2.00 coupon from the April 16th Smart source insert. * Lysol Toilet Bowl Cleaner - 2 for $5.00. Use the save $2.00 when you buy 2 coupon from the April 16th Smart source insert. * Goodnights - $16.99. Use the $2.00 coupon from April Smart Source insert. * Old Spice Deodorant - 2 for $6.00. Use $3.00 coupon when you buy 2 from April PG Brandsaver insert . * Pampers Value pack diapers - Buy 1 get 50 Air Miles. Use $2.00 coupon from April PG Brandsaver insert. * Duracell Batteries - Buy 2 get 50 Air Miles. Use $.75 coupon from April PG Brandsaver insert.